Urban Sediments depicts abstracted landscapes in the form of large-scale reliefs and a three-dimensional floating installation. 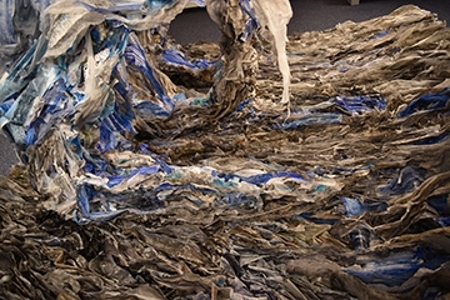 Consisting of assorted torn paper and plastic pieces, these installations draw upon patterns from natural phenomena and urban architecture, blurring the lines between actual and imagined landscapes. The materials include scraps of the artist’s drawings, ink marks and fragments of photos depicting urban life. Together, they evoke the feeling of found objects or trash, like the strata in sedimentary rock, each layer documenting a distinct moment in time and suggesting a hidden narrative.